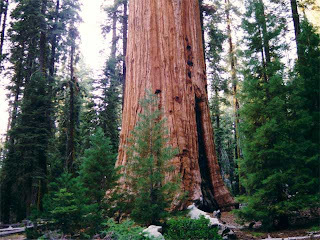 The Giant Redwood or Sequoia is the world's largest tree. It is also the largest living thing on the planet and amongst the oldest living things, with some trees over 2000 years old. It is an evergreen, long-lived, coniferous tree, reaching up to 115.5 m in height and 8 m diameter at breast height (that's equivalent to a 35 storey building). The current tallest tree is Hyperion, measuring at 115.55 m.
Redwoods have a conical crown, with horizontal to slightly drooping branches. The bark is very thick, up to 30 cm, and quite soft, fibrous with a bright red-brown when freshly exposed (hence the name 'redwood'), weathering darker. The root system is composed of shallow, wide-spreading lateral roots. It is native to coastal California and the southwestern corner of Oregon within the United States. The cool, moist air created by the Pacific Ocean keeps the trees continually damp, even during summer droughts. These conditions have existed for some time, as the redwoods go back 20 million years in their present range. Exactly why the redwoods grow so tall is a mystery. Theories continue to develop but proof remains elusive. The trees can reach ages of 2,000 years and regularly reach 600 years. Resistance to natural enemies such as insects and fire are built-in features of a coast redwood. Diseases are virtually unknown and insect damage insignificant thanks to the high tannin content of the wood. Thick bark and foliage that rests high above the ground provides protection from all but the hottest fires. The redwoods' unusual ability to regenerate also aids in their survival as a species. They do not rely solely upon sexual reproduction, as many other trees must. New sprouts may come directly from a stump or downed tree's root system as a clone.